This Black Friday weekend, while the rest of the world was trying to get the best bargain on the latest Bluetooth, noise-cancelling thingumies, or maybe going slightly retro and buying a turntable so they can take part in the vinyl revival, a small but growing group of people were pressing eject on the whole thing. The world of Airpods and Megabooms is not for them. They're interested in a format that most people had assumed was dead, whose revival was either a gimmick or symbolic of a hipster trend, but not the sign of a format with a future. And yet, cassette tapes are back. 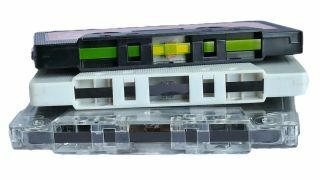 Amazon is selling new cassettes - and they're not cheap either; they are one thing that is not in the Cyber Monday sale - and eBay is full of them. Cassette sales more than doubled in the UK last year and although their share of the music market is still tiny (less than 1%), there were still 22,000 new cassettes sold in 2017. In July this year, the Official Charts Company revealed that sales for the first half of 2018 were up 90% year-on-year. Cassette Store Day, the tape collector's version of Record Store Day, was last month. DJ magazine, meanwhile, has already claimed that the cassette revival has become an essential and exciting part of the electronic music scene, allowing smaller artists the chance to do sought-after limited releases: "The tape revival also allowed music that may have never reached a global audience to do so in physical format." The original album is from 1991 and this cassette is from 2016. The record company got their best guys in to remaster this classic game-changing album. And then some daft fucker stuck it on cassette. Altogether now! "I feel stupid and contagious! Here we are now zzZZsccchhhhhh" etc. Released on cassette earlier this year by Sony, now you can hear Back In Black as most of us did the first time around: across two sides and blaring out of some dodgy ghetto blaster in a garage. NEVER BEFORE RELEASED ON CASSETTE because, well, it's never been released before, the soundtrack to the Freddie movie is pitched squarely at Queen completists. If someone had told you back in 1988 that this under-achieving 6-track EP would be held in such high regard that it would be reissued ON CASSETTE, despite being available to stream digitally for free on Spotify and YouTube, and available on phones as part of a Deezer, Apple Music or Amazon Music Unlimited subscription, you would've been totally confused. Because just about the only bit that would have made sense were the words "on cassette". You can imagine the meeting: "So the vinyl artwork is amazing. It's kaleidoscopic, with a colour wheel that you can turn like a crop rotation thing. It's colourful, conceptual, totally gorgeous. Shall we do something nice for the cassette version?"